This year, Oscar nominations will be announced on Thursday, January 14th. I’ll be offering detailed predictions in most of the major categories, saving some of the biggest categories for last. The rundown: The big shock last year was that eventual Best Picture winner “Birdman” didn’t make the cut, and that’s why I’m not predicting Spotlight to be included, though it really deserves to be here. Its ACE Eddie snub yesterday only cements that likelihood, and I think that that the dramatic lineup could well end up being the Oscar lineup. Mad Max: Fury Road and The Revenant are sure things, and The Martian should be a good bet too. Even if Sicario doesn’t show up in other categories, it should be able to place here. 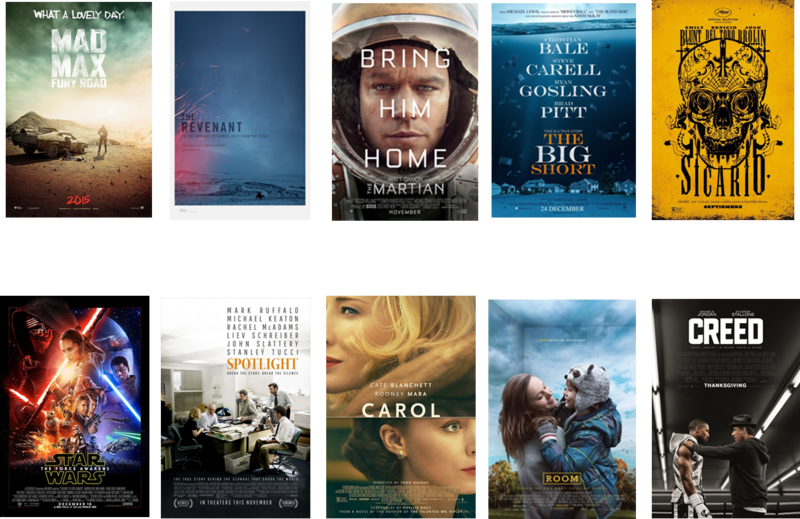 It might end up being a Best Picture nominee, and if it is, I see Star Wars: The Force Awakens showing up here. It’s probable that The Big Short, cited as a comedy by the editing guild, will get in instead. Other possibilities include Carol, Room, Creed, Bridge of Spies, or Brooklyn. Outside shots include The Hateful Eight and Steve Jobs. One possible crazy scenario: Unexpected recognition for the tight pacing of The Walk. Forecasted winner: I see Mad Max: Fury Road triumphing here.